Makeup and beauty gift ideas! If you’ve ever tried to buy a gift for a makeup and beauty lover, you know how tricky it is to find the right gift. There are so many makeup and beauty options, how do you even know what you’re looking for? How do you choose the right color palettes? There are so many deeply philosophical questions here. The good news for you is that I’m a makeup and beauty connoisseur. By which I mean I have entire drawers full of the stuff, and can’t seem to stop myself from buying more. It’s a sickness. A beautiful, lovely, sickness. 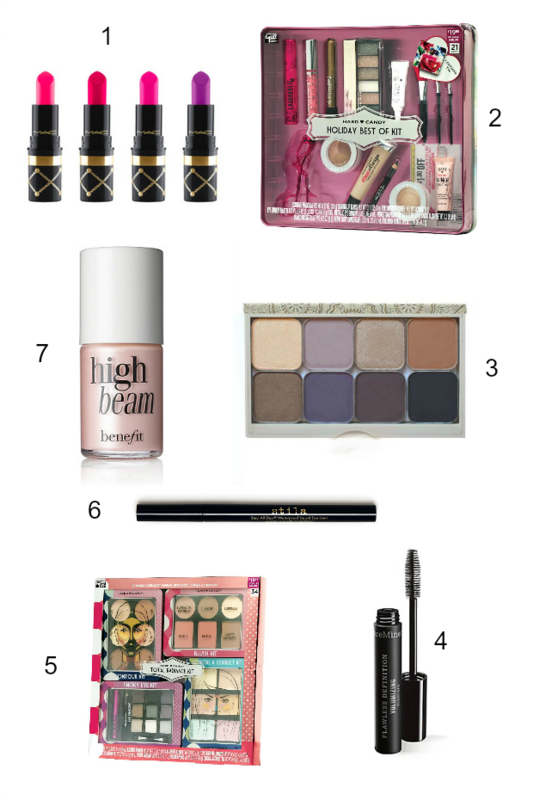 All of which is to say, here are my gift picks for the people in your life who love makeup. This list runs the gamut from really affordable to big splurge so you can choose according to your budget. I can’t really chose a favorite from this list, but will tell you I use the Benefit highlighter, Bare Escentuals mascara, and Stila liquid liner every day. They’re worth their weight in gold. Disclosure: The Hard Candy Holiday Kit + Total Radiance Kit were sent to me by Hard Candy. Thank you! Have fun, and best of luck in your makeup + beauty shopping endeavors.